Roy Wood Jr. appears Friday, Feb. 16 to Sunday, Feb. 18 at Punch Line Philly in Fishtown. 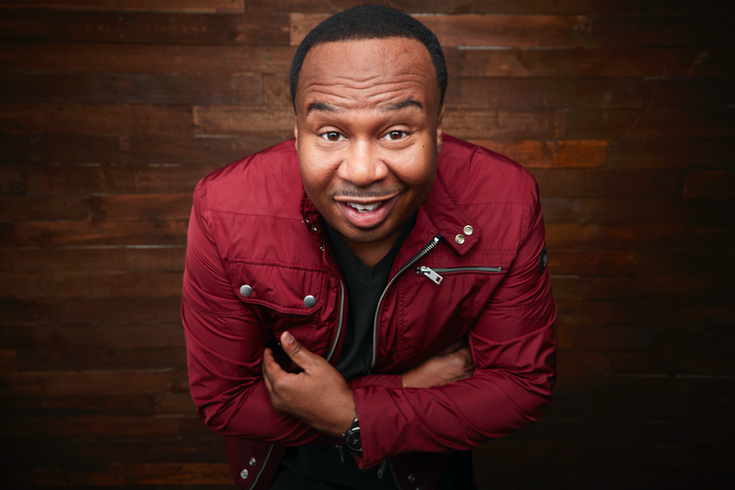 Television audiences know tightly-wound comedian Roy Wood Jr. from his regular appearances on Comedy Central's "The Daily Show," as well as other programs including the faux-documentary series, "This Is Not Happening," and Monday's stand-up special "Father Figure." Yet, Wood has had a long career before Comedy Central – in morning radio and creating prank-phone call CDs. The perpetually annoyed comic will discuss his life and politics when he appears at Punch Line Philly this weekend. We got him on the phone for a quick Q&A. Q: What's your take on Philly? You played here ages ago as a stand-up comedian. A: I used to love appearing at the Laff House on South Street. I would go and eat something at Jim's Steaks or buy new sneakers – late night mind you – at one of a dozen sneaker shops between sets. Q: You were in Florida as a morning news reporter for Hot 105.7 before moving into comedy. How did doing real news – being a reporter – figure into your work on "The Daily Show?" A: There is a degree of fact-checking you must do and real news muscles that get worked at "The Daily Show." Thankfully, before I got to Birmingham, Ala. and writing for "The Buckwild Morning Show," I had shaven off the uptight journalistic behaviors and traded them in for gossip stuff. But, [some of it] definitely stuck with me. There's definitely a level of concern at "The Daily Show" in getting all the facts lined up. Q: You work with like-minded comedian-correspondents. How quickly did you find your own voice there? A: As a correspondent there, our responsibility is to bring and show off your own voice, style and opinions. No one else can touch that. It's been fun to be able to take a segment you pitch – or have one assigned you – that might not be structurally perfect at its inception. With time, you analyze different angles. You shape an outlook. Somebody may pitch me a story about a grocery store and lead with the bananas. I might look at it though, and see that story in the oranges and go from there. It's still a story about the produce department, but maybe there are different relationships to consider now that we're leading with the oranges. Maybe we can include the prunes and lettuce. Maybe the apples don't approve of the bananas behavior. Q: You first got famous for your prank phone call CDs such as "My Momma Made Me Wear This." How did that happen in the first place? A: That was all about me trying to keep a job, dude (laughs). I began making calls when I started radio in Birmingham because I was told that my predecessor, Rickey Smiley, who is now nationally syndicated, made that his thing. The station dug that. So I started doing them in order to keep my job. This was before YouTube, so going viral meant people e-mailed your stuff around. So I put my prank phone calls on my website. Because the station's webmaster at that time was really lazy, he wouldn't put them up on their station's website. So I put them on mine. Suddenly, I started getting e-mails from Iowa and Wyoming and across the South. These people weren't listening to the station. They heard of them from my website and shared them via e-mail. From that point forward, we were off to the races...All because of a lazy webmaster. Q: How did stand-up become your thing and how soon after you started did you find a signature? A: 1998. I was doing hard news and making a transition to radio sidekick around the same time. Now, that station had a comedian who was a school teacher, so he could only tell jokes until 8 a.m. when he had to leave for school. So, from 8 [a.m.] to 10 [a.m.] I did news and cracked jokes. After a few months of that, in the morning, I figured, why not take it to it to the stage? But I don't believe that I captured the essence of who I am until 2006. It took a minute. I was burned out on radio. I was annoyed and perturbed at, well, life. Things weren't going as quickly as I wanted them to. So, I was frustrated. My stand-up reflected that. By the time I did Letterman in 2006…I had a lot more to be annoyed about. Q: You are all over Comedy Central. What's so frustrating now? A: I hate that people look at the big picture and rarely the small picture. I believe there is, to some degree, such a focus on politics on a national level that we miss the local level. We should be more open to changing lives and creating opportunities at that local level. We're so bogged down by national outrage that too many things fall by the wayside. Q: Have you had enough of having to report what goes on in Washington, D.C. on a minute-to-minute basis or is that vein too rich to not mine? A: I don't believe there is any one person, topic or trend worth the suffering that happens in the real world – because of their actions – that I would exchange for a laugh. I would always prefer not to discuss good people being deported. I would rather go back to making fun of how high Obama wore his pants than another word about this administration. Plus, a more boring time period – or one at least a little action packed than this – might force comedians to make up new material that's relevant and hits hard. Roy Wood Jr. appears Friday, Feb. 16 to Sunday, Feb. 18 at Punch Line Philly, 33 E. Laurel St. in Fishtown. Tickets are $25-$35. Show times are between 7:30 p.m. and 10 p.m. throughout the run.